Thomas Rowlandson (1756-1827) was one of England's great satirists and a master of pen drawing and watercolor technique. Born to a tradesman in the London's Old Jewry, he was raised by his wealthy silk merchant uncle after his father went into bankruptcy. When his uncle died, his aunt paid his way at school, in Paris and from 1772 at the Royal Academy, where he first exhibited paintings in 1775. Lacking success as a traditional painter, he gravitated to caricature and social satire — and his career took off. He inherited a fortune when his aunt died in 1789, but squandered it in several ruinous years of dissipation and gambling, sometimes gaming for two days without sleep. 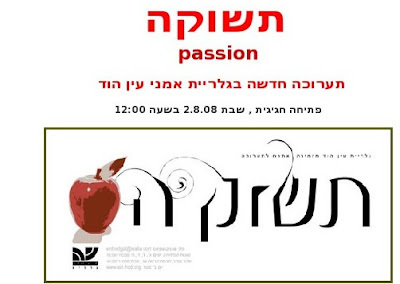 Thomas's coloured ethings cannot be found at the new exibition in Ein Hod Gallery called "Passion". The opening is tomorrow at noon.